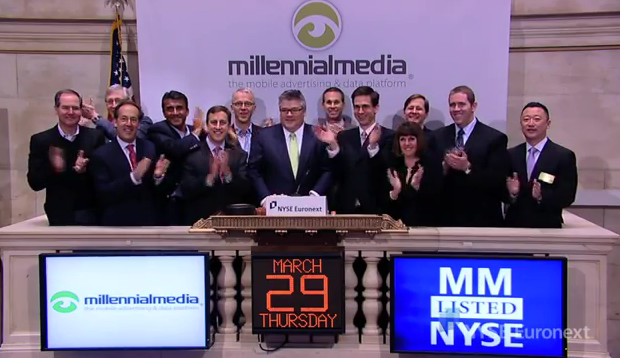 Mobile ad network Millennial Media just debuted on the New York Stock Exchange under the symbol “MM,” and saw shares pop 97 percent in the first trade of $25. The company initially priced its IPO at $13 per share last night, after increasing the range on Tuesday. At $25 per share, Millennial’s valuation jumps to nearly $2 billion. Trading reached as high as $27.90 in early trading. UPDATE: Millennial closed at $25 per share. Millennial which filed its original S-1 in early January, raised over $130 million in the offering, which is up from $75 million originally stated in earlier filings. Millennial, which is one of the largest remaining independent mobile ad networks, currently serves ads to 200 million unique users worldwide, including approximately 100 million unique users in the United States alone. More than 30,000 apps are enabled by developers to receive ads delivered by Millennial. From 2009 to 2010, Millennial’s revenue increased 195% from $16.2 million to $47.8 million, and the company took a net loss of $7.6 million, and $7.1 million, in those years, respectively. From 2010 to 2011, revenue increased 117% from $47.8 million to $103.7 million. In 2011, the company saw a net loss of just $287,000. In 2010, Palmieri jokingly called Millennial the quiet giant as competitors like Quattro (acquired by Apple) and AdMob (acquired by Google) stole the spotlight. Clearly that’s no longer the case.